Swimming with the sharks at the upcoming Angel Summit: The Center for Innovation and Entrepreneurship (CIE) and CMC Alumni Association (CMCAA) will present the inaugural Angel Summit on May 1 during Alumni Weekend. The half-day summit will include a panel discussion on “Best Practices for Angel Investing” featuring prominent alumni in business and venture capital, followed by an ABC-inspired “Shark Tank” pitch event for new venture ideas at the startup stage. The goal of the Angel Summit is to facilitate an exchange of ideas, collaboration and provide a potential platform for financing. The event also offers a rare networking opportunity for entrepreneur-minded alumni, current students and parents (no geographic limitations). For CMC students and alumni interested in pitching their ventures, applications are due on April 3. Apply to pitch or register to attend this event. 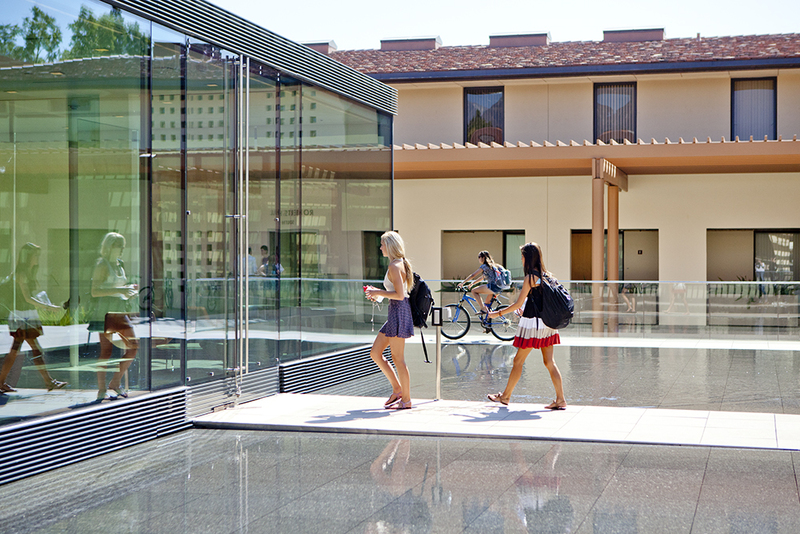 A social innovation stamp of approval: With its designation as a Changemaker Campus by Ashoka U, Claremont McKenna joins an elite group of higher ed institutions devoted to fostering social impact. “... At CMC, we see a dedication to social innovation across the entire institution, both inside and outside of the classroom, from student projects all the way to President Chodosh’s inspirational leadership,” said Michele Leaman, director of the Changemaker Campus Initiative at Ashoka U, which is part of the world’s largest network of social entrepreneurs. “This sort of deeply embedded, cross-campus energy around social innovation is exactly what we look for in a Changemaker Campus.” The College is among only 30 global higher ed institutions sharing this special designation. Keep your eyes on him: Ernie Iseminger, who serves as CMC’s Vice President for Development and External Relations, has been named as one of “6 people to watch in 2015” by The Chronicle of Philanthropy. In bestowing the honor, the publication cites the recent success of the $635-million Campaign for Claremont McKenna and a great start for The Student Imperative fundraising initiative. Seeing green: CMC is No. 3 nationally for liberal arts graduate earnings in their first job, according to NerdScholar, the higher education information site aimed at prospective college students. That makes CMC the highest-ranked liberal arts college nationally on the list, and the highest-ranked higher ed institution west of the Mississippi. Video-sharing a vision: Where is CMC headed? During the October 2014 Board of Trustees meeting, Chair David Mgrublian ’82 P’11 offered some answers in a presentation held at the Athenaeum. To listen to the vision of our Chair, watch the video. New interactive map: Need help finding your way around our ever-changing campus? The CMC website now has a new mobile-optimized map featuring detailed three-dimensional renderings of every building on campus. Click on a building to read a description, see photos or watch a video, and learn more through links to further information. To get started, visit the map. Stags have a new soccer coach: Matt Edwards has been selected as the sixth head coach in the 46-season history of the Claremont-Mudd-Scripps men’s soccer program. Edwards comes to CMS after three seasons at Knox College in Galesburg, Ill., where he transformed the men’s soccer program from a one-win team into 2014 conference champions. Edwards earned Midwest Conference Coach of the Year honors and his team earned the National Soccer Coaches Association of America (NSCAA) Team Academic Award in 2013. A key leadership role for CMC's alumnus governor: Montana Gov. Steve Bullock ’88 was appointed chair of the Democratic Governors Association last December. With his appointment imminent, The Washington Post ran a Dec. 8 article about Bullock that quoted one of his key mentors at CMC, Professor Jack Pitney, and cited our profile of Bullock in the fall issue of CMC Magazine. See The Washington Post article. Coveted Mitchell Scholarship goes to recent grad: Gavin Landgraf ’14 has been awarded a highly competitive George J. Mitchell Scholarship to study natural resource economics at National University of Ireland in Galway. According to the news release from the U.S.-Ireland Alliance, which administers the award, the nationwide competition drew 270 applicants and only 12 received scholarships. Ireland’s Ambassador to the U.S., Anne Anderson, announced the recipients on Nov. 21 at a VIP reception held at the Irish Embassy in Washington D.C.
Hosting The Hult: The Hult Prize Competition has been named by former President Bill Clinton and Time magazine as one of the top five ideas changing the world, and last fall, CMC became one of only 112 schools worldwide selected to host a Hult Prize event. The prize selects and helps to launch startup enterprises that tackle the problem of poor quality education in urban slums by providing “seed” money amounting to $1 million for the competition winner. The team of Kate Anello ’16, Milly Fotso ’16, Khadija Hassanali ’17 and Vanessa Liu ’17 won the CMC competition and will go head-to-head with other student teams March 13-15 at the Hult Prize Regional Finals in San Francisco. Finding their space in 'The Cave': CMC students are known for having a multitude of talents, and music is often one of them. But space for CMC’s musicians to practice and perform had been hard to find, that is, until the recent opening of The Cave. Located in the basement of Marks Hall, the new performance space was inaugurated last fall with student artists reciting poetry, playing instruments and singing to a packed house. A good run: Nathaniel (Nathan) Tsai ’17 squared off in the fall elections against incumbent Democrat Chris Holden of Pasadena to represent California’s 41st District in the State Assembly. Although he didn’t win, Tsai garnered 41% of the vote — an impressive showing for his first try at public office, especially considering that former longtime Congressman David Dreier ’75 also lost his first bid for Congress 54% to 46% back in 1978. Evans wins major grant to study water pollution: The John Randolph Haynes and Dora Haynes Foundation has awarded Robert Day School Professor Mary Evans a grant of more than $100,000 to support her research project, “The Governance of Water Pollution Dischargers in Los Angeles: Evaluating the Effectiveness of a New Enforcement Strategy.” Evans is the Jerrine and Thomas Mitchell ’66 Associate Professor of Environmental Economics and George R. Roberts Fellow. Education = growth, says Keil at Inland Empire Conference: “We have to make the area attractive to businesses to come here, and I think the only way to do this is to have a better-educated labor force...” So said Manfred Keil, associate professor in the Robert Day School of Economics and Finance, during the Inland Empire Forecast Conference co-hosted by the Rose Institute of State and Local Government and the Lowe Institute of Political Economy with UCLA Anderson Forecast. Long before Nolan's 'Interstellar,' there was Wichman: Emeritus Psychology Professor Harvey Wichman was recently inducted into the Space Hall of Fame for his involvement with the pioneering DC-X rocket program. The DC-X project marked a revolution in rocket design during the 1980s and early 1990s — the rocket’s vertical takeoff and landing ability promised the kind of quick turnaround and reusability that, until then, had been an element of rocket design only in science fiction books and movies. Wichman founded and directed the College’s Aerospace Psychology Laboratory and taught in CMC’s innovative Practicum Program.